A member of our Threads of Love group just had a baby girl. You can find the bishop here. She is such a huge help to us, that I wanted to do something for her. I chose to make matching dresses for the baby and her older sister. This is the Larkin by Maja's Heirlooms. It was recommended to me by Kathy Dykstra. It is a great dress for an older girl. I found the smocking plate in issue 105, 2006 SB magazine. There were a ton of beads in this pattern, and if I don't ever see another bead, it will be too soon! LOL My bullions still need a little practice, but they are getting better. The sleeves are probably my favorite. I love lace!! See the review below for the modifications I made. I struggled with the neckband and the back facings, so I did them the way I've always done them. It's a great pattern, and I recommend it. Pattern Description: Smocked dress for older girls who've outgrown traditional smocked dresses. Pattern Sizing: 10, 12, 14, 16 (I made size 12) NOTE: the pattern runs small. Were the instructions easy to follow? Not as easy as I would have liked. I had some difficulty with the neckline and back facing which I address below. What did you particularly like or dislike about the pattern? It is a great pattern for older girls. And it's beautiful one made. Pattern alterations or any design changes you made: I chose to do a traditional neckband like I've always done on my bishop dresses. The pattern appears to fold the pleating over to the back. This really distorted the pleats. So the traditional neckband worked better for me. I simply cut the bias band to 2 1/2" to allow for the extra. She actually makes this adjustment in issue 105, 2006 SB magazine. I found it after the fact when searching for a smocking plate. Speaking of smocking, I used the pattern in the same issue of SB designed specifically for this pattern. The tiny beads are seed beads I picked up online. They are smocked into the design rather than added later as is done quite often. I think they hold up better when smocked in. Bullions are embroidered at the bottom of the last row of smocking. I used french lace on the sleeves using a machine technique to stitch lace to lace and lace to entredeux. I think the sleeves just needed a little something extra. The sleeves are also smocked with a tiny bullion added in the center of the design. I didn't like the way the back facing was done. The pattern calls for folding the placket to the wrong side then stitching down the facing. I didn't like that edge showing. I chose to fold the placket to the right side, then put the facing down right side, then fold the lining placket on top of that, basically sandwiching the facing in between the placket and placket facing then flipping to the wrong side enclosing all the raw edges. Then to keep the facing in place, I ironed a small piece of heat bond in between the placket and facing. And I put piping where the skirt front joins the bodice. I just thought it needed something there too. Would you sew it again? Would you recommend it to others? Yes, I think it's a great pattern with modifications. Conclusion: This is a very sweet dress for older girls. It was relatively easy once I figured out some of the instructions. 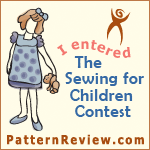 This has been entered in the sewing for children contest on pattern review. I would love your vote. See the badge to the right. Thanks for stopping by! I am happy to answer any questions. Just email me or post it below.